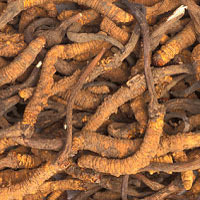 Some athletes say that cordyceps helps strengthen the body when fatigued. Currently, there are over 160 articles published regarding the effects of the administration of cordyceps. However, only a couple of these articles are related to its effect on exercise performance. One of these articles suggested that cordyceps may enhance exercise capacity by improving glucose tolerance. It was also reported that cordyceps containing cordysepic acid and adenosine has demonstrated an ability to increase energy and endurance as well as reduce the onset of exercise-related fatigue. Some athletes who participate in endurance exercise events, such as distance running, swimming, cycling, adventure racing, etc., rather than sprinting, weight-lifting, etc. notice an improvement in exercise capacity and tolerance from supplementing with cordyceps.